Who is selected to fill the vacancy on the Supreme Court will profoundly affect key public health issues, including gun control, access to reproductive health services, and climate change. In recent years, the Court has ruled, usually by 5-to-4 decisions, on these issues and will likely continue to do so by narrow margins. Whoever fills the vacant seat is likely to tip the balance, one way or the other, on future Court decisions related to these issues. Handguns account for 33,000 deaths annually in the United States. Gun control, such as restricting gun ownership, has been demonstrated to be a successful method for reducing these fatalities. The Supreme Court in recent years has overturned municipal ordinances in Chicago and Washington, D.C., that banned residents from keeping handguns at home for the purpose of self-defense. These decisions have led to weakening of other gun-control laws and regulations in states and communities across the country. In the near future, the Court is likely to hear more cases related to the availability and accessibility of handguns – and therefore related to the epidemic of gun-related violence in this country. In recent years, the Court has made many decisions that have chipped away at a woman’s right to choose, which is supported by the Court’s 1973 Roe v. Wade decision. Now providers of healthcare for women are asking the Supreme Court to repeal a 2013 state law in Texas that mandated new requirements for facilities where abortions are performed. That law would likely lead to the closure of more than three-fourths of these facilities and prevent the opening of new ones. More cases on access to contraception, access to abortion services, and other reproductive rights and reproductive health services will come before the Court in the foreseeable future. How the Court decides on these matters will have profound effects on the health and well-being of women and their families. The Roberts Court (October 2010 – February 2016). 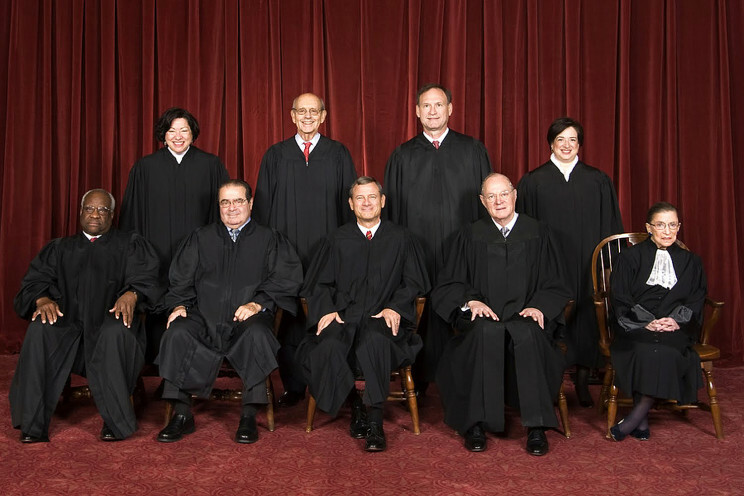 Front row (left to right): Clarence Thomas, Antonin Scalia †, John Roberts (Chief), Anthony Kennedy, Ruth Bader Ginsburg. Back row (left to right): Sonia Sotomayor, Stephen G. Breyer, Samuel A. Alito, Elena Kagan. Photo by Steve Petteway, Collection of the Supreme Court of the United States. Public domain via Wikimedia Commons. Climate change is increasing the occurrence of heat-related disorders, exacerbating chronic respiratory and allergic conditions, vector-borne and other infectious diseases, injuries due to extreme weather events, collective violence, mental health problems, and, due to food insecurity in drought-stricken regions, malnutrition. Emissions from coal-fired power plants are a major source of greenhouse gas emissions, which are the major cause of climate change. The Supreme Court, which recently stayed President Obama’s executive order to restrict emissions from coal-fired power plants, will ultimately review the constitutionality of this order and, more generally, the Environmental Protection Agency’s ability to regulate greenhouse gases. The global leadership of the United States on climate change is vitally important. Unfortunately, the Court’s stay of the President’s order is delaying US implementation of the climate-change agreement to which 195 nations agreed in Paris just two months ago. Arguably, the justice who fills the vacant seat on the Supreme Court will have more impact on public health for the next several years – or longer – than the Surgeon General or the Director of the Centers for Disease Control and Prevention. As long as the seat is not filled, the Court will likely be deadlocked on gun control, access to reproductive health services, and climate change – and perhaps other issues impacting public health. Decisions on these important issues should not have to await the results of the presidential and senatorial elections in November. Public health has been defined as what we, as a society, do collectively to assure the conditions in which people can be healthy. How the vacant seat on the Supreme Court is filled will have a profound effect on how our nation assures – or fails to assure – the conditions in which people can be healthy. Featured image credit: Supreme Court by Mark Fischer. CC BY-SA 2.0 via Flickr. 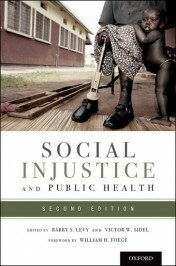 Barry S. Levy, M.D., M.P.H., and Victor W. Sidel, M.D., are co-editors of two editions of Social Injustice and Public Health as well as two editions each of the books War and Public Health and Terrorism and Public Health, all of which have been published by Oxford University Press. They are both past presidents of the American Public Health Association. Dr. Levy is an Adjunct Professor of Public Health at Tufts University School of Medicine. Dr. Sidel is Distinguished University Professor of Social Medicine Emeritus at Montefiore Medical Center and Albert Einstein Medical College, and an Adjunct Professor of Healthcare Policy and Research and an Adjunct Professor of Medical Ethics in Medicine at Weill Cornell Medical College.